Clint Heinze--Enchiladas are a favorite at Pancho Villa’s. Living in southern California gives people plenty of options when it comes to Mexican food. There’s the fast-food chain restaurants, the mom and pop diners, the well-established restaurant and the small joints. But not all offer authentic Mexican food. How does the hungry, Mexicanfood- craving college student deal? Just ask a Mexican! Or a Mexican-American, like myself. Below you will find some delicious, authentic finds for all budgets in and around Riverside. Tina’s Mexican food – ” I remember visiting this place ever since I was little (I was born and raised in Riverside) and the line wrapping around the building. They moved down the street – ” literally, like two blocks down – ” and although the new place make it impossible for people to wrap about it, they still offer high quality food. One of the best dishes here is the Tina’s Special. This can plate includes a ground beef taco, a cheese enchilada (perhaps the best item in the lineup), a tostada and a tamale (kind of stale with a thick masa/corn covering). The price for this hearty meal is a little over seven dollars, not too cheap but not too expensive either. And since there’s so much food on this plate, it can count for your lunch and dinner. And maybe even tomorrow’s breakfast! Alberto’s Mexican Food – ” Although Alberto’s acts more like a fast-food place than the other restaurants, the food here is mostly authentic. The beef tacos combination plate is one of the most popular dishes. The tender beef meat is placed inside hard shell tacos, coupled along with beans and rice. Other special combinationinclude the burrito and enchilada plate and the carne asada soft tacos. These combination dishes go for about $6.50, drinks separate. There are two near CBU, one toward Arlington and the other closer to Jackson. Pancho Villa’s – ” A little further and pricier than the other restaurants, Pancho Villa’s offers dinner and a show. The Fontana located restaurant gives guests a chance to experience high quality food and mariachi music performed right in front of them. The chicken enchiladas at Pancho Villa’s are outstanding. The perfectly sautéed chicken and tortillas dipped with enough sauce is better than other places I’ve visited. Even the red sauce enchiladas are good. I usually get green ones, but these red ones are delicious as well. The long menu gives guests a wide variety of food to choose from and perhaps even more temptation. Tony’s Mexican food – ” With two small joints around Riverside, one on Arlington past Van Buren Blvd. and the other in east Riverside, Tony’s Mexican food offers a friendly budget with good food. The bean and cheese burrito is a favorite for me at this place. But the combo for this plate mixes up the culture as French fries become a side order alongside a drink. This goes for a just under four bucks. One other noteworthy aspect about Tony’s is that on Saturdays, tostadas are super cheap, 50 cents each one. The other items a la carte at the restaurant start at a dollar and move increase up to about three. Don Charro’s – ” The hole in the wall found close by the Riverside Plaza is an excellent find. It is located inside a grocery store (that mostly just sells meats and produce) but the food is super authentic. The male cooks make prepare the food like if it were for themselves, giving generous portions for a reasonable amount of money. These guys even made a special order for my family and I since we used to frequent often. 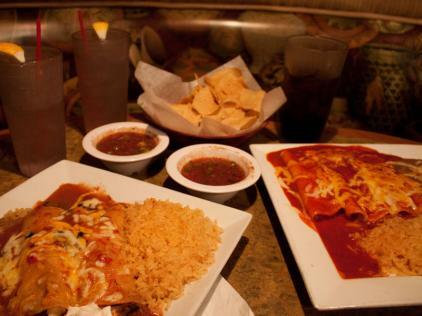 The flautas and enchiladas are fresh and served with rice and beans. Although Don Charro’s does not have the best appearance, stuck inside with limited room, it offers flavor-filled food at a great price. These places are my favorite places to eat when I don’t have all of the ingredients (time and even energy) to make the food on my own. Skip Taco Bell and Del Taco next time and visit one of the places above for a new favorite that delivers real Mexican food.